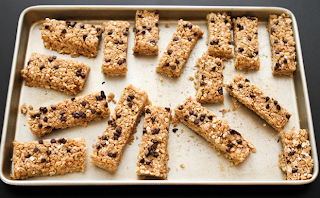 Happy Friday love bugs, here are some of my favorite recipes for the week! Heat water to the boiling point and pour over the tea bag in a mug. 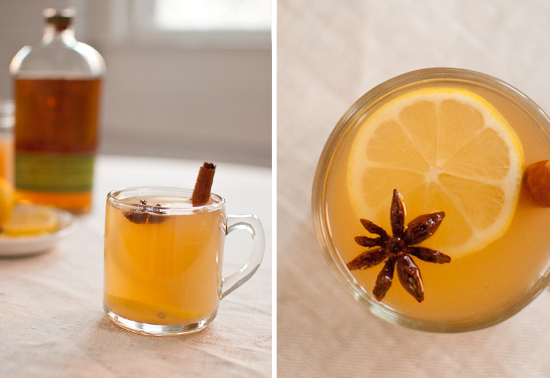 Leave about an inch of room in your mug for the whiskey and cider. Let the tea steep for a few minutes, then discard the bag so the tea doesn’t get bitter. 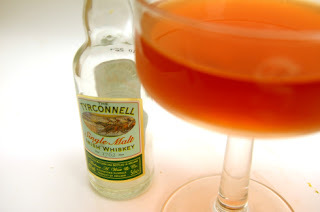 Pour in the whiskey or bourbon and a hefty splash of apple cider (adjust these amounts to suit your tastes). 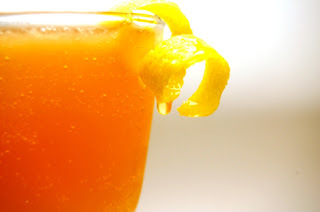 Squeeze in the juice of half a lemon and garnish with lemon slices, a cinnamon stick and a star anise. Sip up. Prepare broth: In a large (5-quart) heavy pot over medium-high heat, heat the vegetable oil. Add the onion and saute it for 3 to 4 minutes, until beginning to take on color at edges. Add the chicken pieces (if too crowded, can do this in two batches), making little wells in the onions so that the parts can touch the bottom of the pan directly. Cook chicken parts until lightly browned, about 10 minutes. Add water, bay leaf, table salt and some freshly ground black pepper and bring the mixture to a boil. Reduce the heat to a simmer and skim any (sorry for lack of better term) scum that appears at the surface of the pot. Simmer pot gently, partially covered, for 20 minutes. Transfer chicken parts to a plate to cool a bit before handling. Set a fine-mesh strainer over a bowl (ideally, with a spout) and pour soup through it. If your pot looks grimy and you’re fanatical about having a clear soup, you can give it a quick wash before returning the broth to the pot. You can remove a bit of fat at this point, if it looks necessary. Bring the broth back to a simmer. You may be tempted at this point to taste it and add more salt. I know this because I do it every single time, adding another teaspoon, and every. single. time. I regret this as it is too salty in the end. So, proceed with any re-seasoning with caution. To finish and serve: Add diced vegetables and simmer them until they’re firm-tender, about 5 minutes. Add dried noodles and cook them according to package directions, usually 6 to 9 minutes. While these simmer, remove the skin and chop the flesh from a couple pieces of chicken, only what you’re going to use. 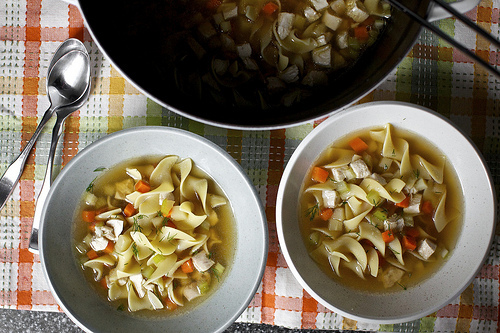 You won’t need all of it in the soup. I usually use the breasts first because they’re my least favorite and benefit the most from the extra moisture of the soup. The remaining parts can be slipped into an airtight bag in the fridge (I recommend leaving the skin on for retained moisture until needed) and used for chicken salad or the like over the next few days. Once noodles have cooked, add chicken pieces just until they have rewarmed through (30 seconds) and ladle into serving bowls. Garnish with dill or parsley, dig in and let it fix everything that went wrong with your day. 2. Melt the butter in a large pot over medium heat and cook the onions until translucent and softened. Add garlic, salt, and pepper and cook and stir for 30 seconds. 3. Add flour and mix well for 30 seconds, or until the mixture is bubbling. Stir stock, milk, and ranch seasoning into flour mixture.Turn heat to medium high and add one cup cheese and continue to whisk as mixture comes to a simmer. Taste and adjust seasoning. 4. Add rice and lower heat to medium low. Cook until the rice absorbs most of the liquid and is tender, stirring occasionally, about 20 minutes. Stir in the sour cream, then stir in the chicken and bacon. 5. Pour the mixture into a greased 9 x 13-inch casserole. 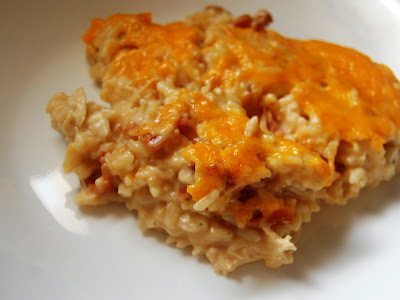 Sprinkle the remaining 1/2 cup of cheese evenly over the rice. Bake for 20 to 25 minutes or until the cheese is melted and the casserole is bubbling. Don't forget to send me your holiday gift guide needs and wants! Who is the toughest to shop for on your list and why? Metal cap toe is a big trend this winter, but so often we see this trend in black or gray, it's sassy, but it's also a snooze. How about a cap toe with some color? Holy moly do I love these shoes. I'm a sucker for mary janes as it is, so when you edge it up with a metal and put it in a pop of yellow- I'm sold. You certainly can't beat the price, and the color is so decadent! 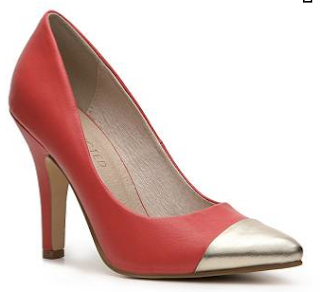 This blush stiletto will mix with just about anything in your closet. Dresses, jeans, you name it. I like a shoe that demands something, like this one: just dance. Not a problem little one, not a problem. Sure, you can wear a sky high black heel with a gold cap toe, or you can wear a splash of color, something noticeable that will demand attention right down to your toes. Next week I'll do some gift guides for the holidays, but I'm asking for your help! Leave a comment or shoot me an email requesting who you need a gift for; example: the nerdy secretary, the fashionable coworker, the boss, you name it, I will do my best to deliver! Alright, back to business, today we're looking at animal print. Not the usual leopard or snakeskin, but rather an image of an animal. Let me explain. How adorable is this sweater? It's quirky and cozy in all the best ways. You may be thinking, sweatshirt? Come on. But layer a white oxford under this and add a collar necklace. Instant chic! 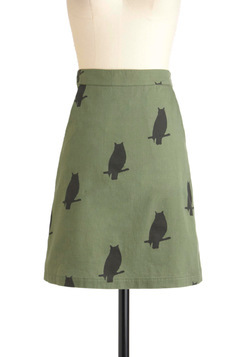 A stunning skirt, perfect for work, I'd pair it with some flat boots and tights. I love this print, but you know what I love more? The dot cuffs. That's right, how sweet is that? So give the leopard print a break this season and try animal graphic that is big and centered or a smaller repetitive print. How was your holiday? Are you stuffed? Any good black Friday sales? 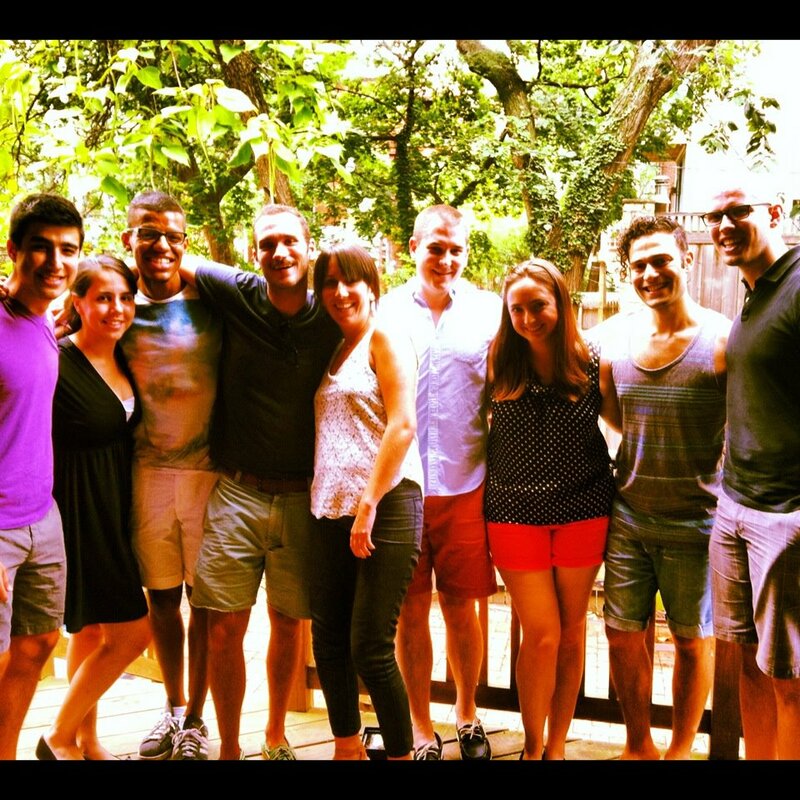 If you're a little familyed-out you might be feeling a bit rebellious. A little edgy, a little, 'you don't get me', I have the perfect trend for you. Gunmetal. I great color that pushes the envelope. 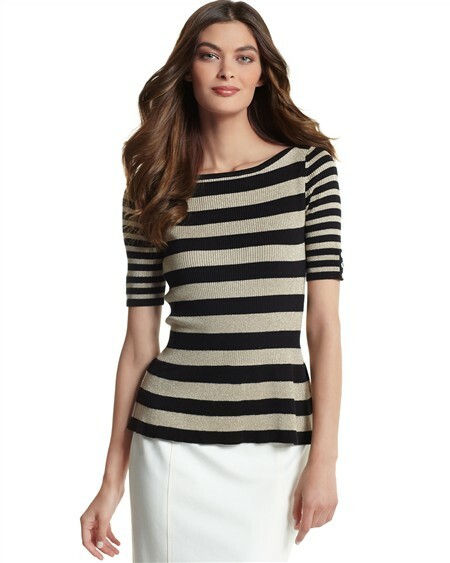 The perfect dress it up dress it down pullover for this winter. I told you it was a little rebellious. Release your inner rockstar ladies. Holiday party anyone? This will certainly turn heads. 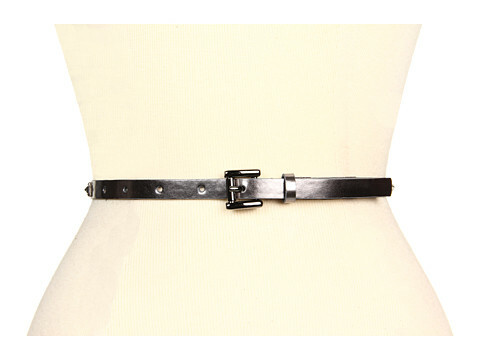 This might be the most versatile belt you own, over cardigans, dresses, pants, you name it. 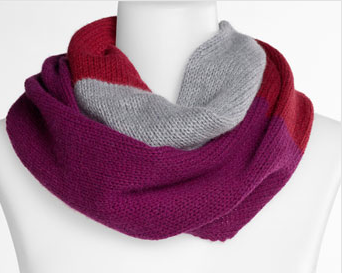 Gunmetal doesn't always have to be cold, warm it up this winter by pairing it with neons or saturated jewel tones. Today we're looking at some really fabulous booties. They're wedge booties which means they're comfy and stylish and they give you just a little extra lift. These could be in a museum. Look at these lines, just stunning curves in a delicious chestnut color. Oh, and PS they're $20. Look at the detail on these bad boys! Hello Saturday night! Check out these majorly on sale booties. I love that the print is continued on the heel. The fold over on this bootie gives it a 'I'm hot but I don't need to show it off' kind of air. 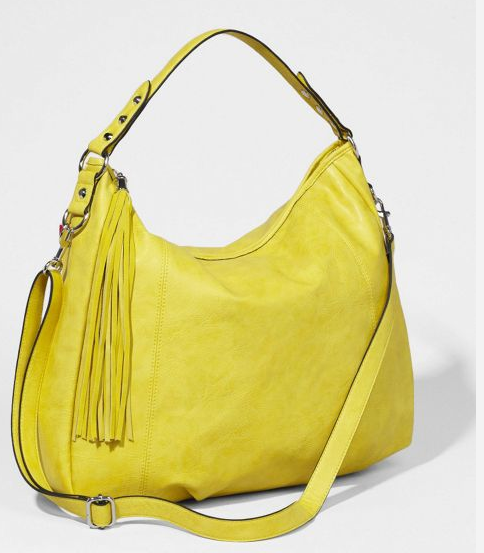 Love a good tassel on the back as well. Booties are huge right now, and the wedge adds another dimension to the trend. 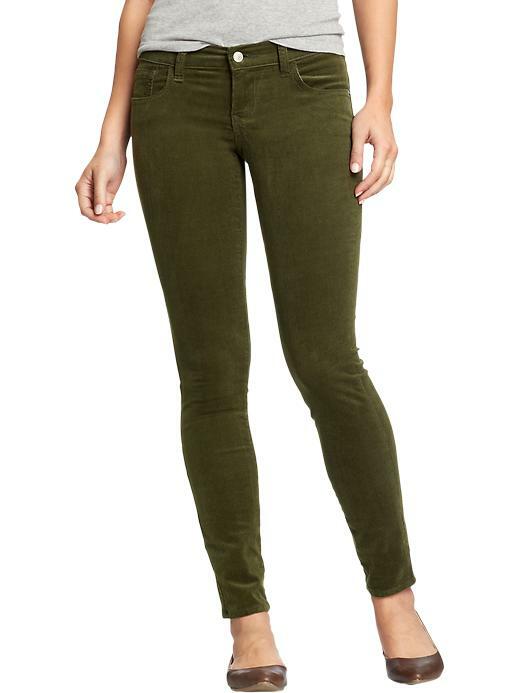 Pair these with jeans and let them show off or tuck them under. Tomorrow or Thursday, a lot of us will be lugging a suitcase, bundling up and hurrying up just to wait at an airport. 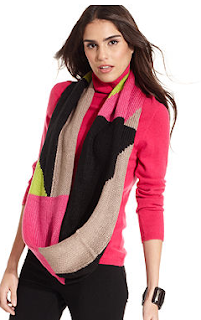 Why not put the yoga pants away this season and dress smart yet comfy for your travels. Here's my go to travel outfit. 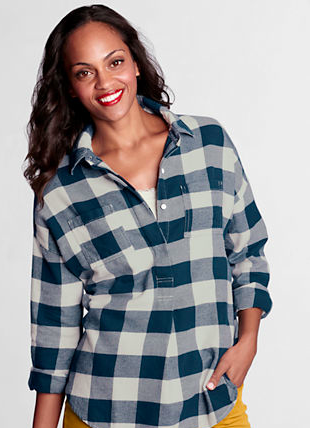 This popover flannel is perfect because it has a relaxed but cool look that you can layer under or over. 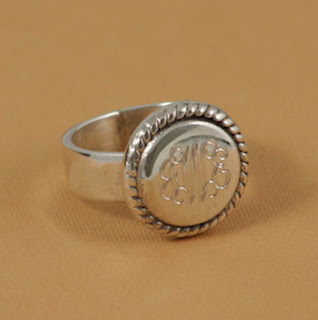 This is a great neutral color that allows you to wear just about any color with it. Easy slip on and off for TSA. A little bling and very versatile. I love a cross body option bag when traveling just in case I need to use both hands. That's how I dress for travel, what about you? Happy short week to you. 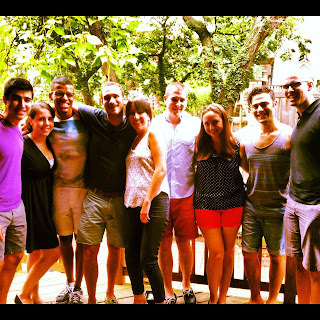 I hope you have plans to visit friends and family at the end of this week. Today we're looking at one of my favorite textures in fashion: velvet. It is so decadent and cozy and it's just perfect for the holidays. Take a look at some of these velvet bags. Leave it to Anthro to take velvet to a new level. Look at this detail and the colors are just stunning. This is just perfect for a holiday dress. 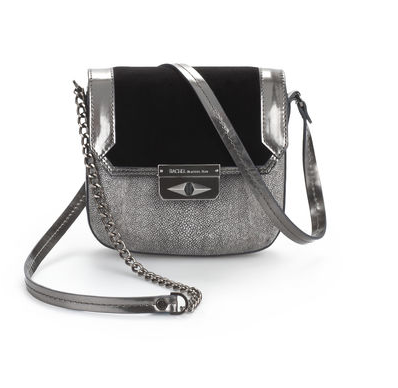 It also comes in pewter and black. I love this with skinny jeans and sky high heels. A little rocker, a little disco, a lot awesome. The perfect Thanksgiving clutch. 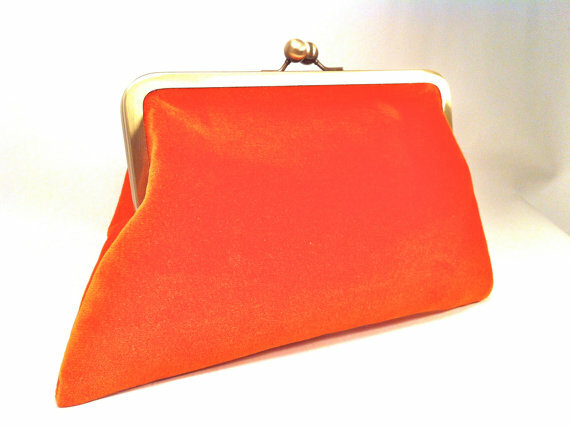 I mean, orange velvet, come on. 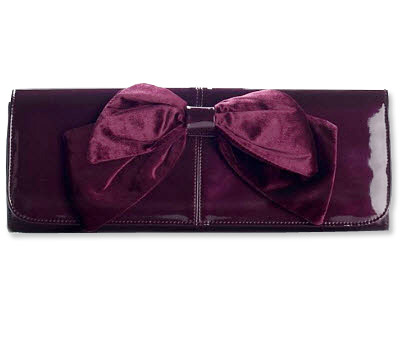 What are your thoughts on velvet for the holidays? I think mixing in pieces like a bag or a blazer is a great way to step up an outfit. Happy Friday! 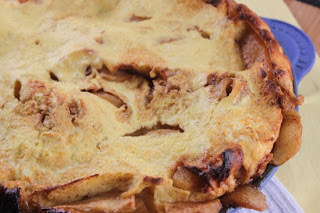 Here are my favorite recipes from this week. In a bowl, combine the turkey, ricotta, Parmesan, egg, salt, oregano and spinach. It will sort of look (but not smell) like tuna salad when combined. Spread a thin layer of the marinara sauce on the bottom of a 9x13 pan. Using an ice cream scoop, scoop the meat and plop (I bet Martha doesn't use the word "plop" in her recipes.) it in the marinara-covered pan. Repeat until all of the meat has been scooped into the pan. 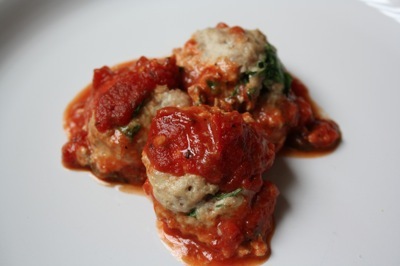 Pour the remaining marinara sauce over the top of the meatballs and cook for 30 minutes. Preheat oven to 350 degrees. Place sliced tortillas into a large bowl. Drizzle oil over wedges and toss to coat evenly. In a small bowl, stir salt and lime zest together and sprinkle over tortillas. Toss again to coat evenly. Place onto baking sheets in one even layer and bake 5-7 minutes or until golden brown and crispy. 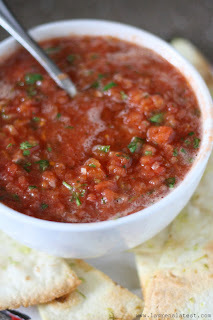 For the salsa–place all ingredients into a blender or food processor. Pulse a few times until desired texture is reached. Taste, adjust seasonings, and serve with chips. Store salsa in airtight containers for up to 3 weeks in refrigerator. 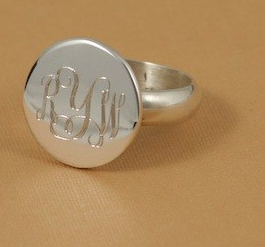 Today we're looking at monogram rings. Monograms are a great gift for the holidays, and I think a ring is a small and simple way to show your personalized piece. Simple, great edges, something any girl would love. 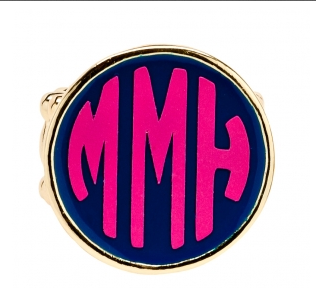 How preppy and fantastic is this ring? It also comes in two other colors. 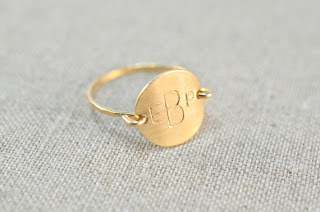 Delicate, simple, and a little rustic! The braid makes this piece look antique. 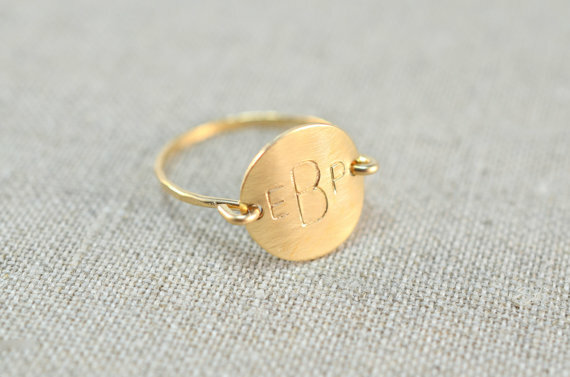 Whether it's a gift for someone else or yourself, a simple monogram ring is a simple piece that will go with everything. Today's post is courtesy of The bf. He suggested a post on wide stripes. So let's go with it. A pattern that is strong yet casual. Do you know why I love this sweater? Because it has the word 'happy' in it. And that is the perfect way to describe this sweater. 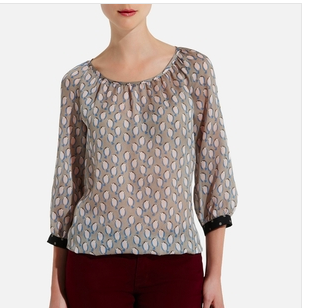 Marked down from $80, this quiet peplum shirt is perfect for work or play. How cute is this little shift? With or without tights, I'd add a neon skinny belt and walk out the door! I like this blazer because it's not a stiff and stuffy. A great sweater type blazer that is great to pair with jeans or an LBD. I think The bf nailed this one. 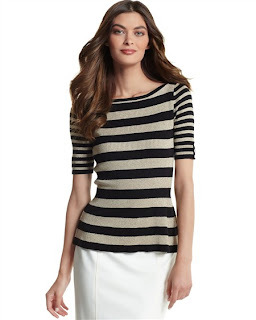 Wide stripes are fun, versatile, and as Gap puts it, happy. You all know I love a great flat. And there are so many types of flats, ballet flats, mary jane flats, dainty flats, but today we're looking at what I'm calling power flats. The 'I mean business flat'. A slight metallic hue to the deep red paired with some studs. Heck yes. A cap toe metal? Don't mind if I do. Why yes, I will be owning this business meeting today. Sleek, a little masculine, but a lot powerful. 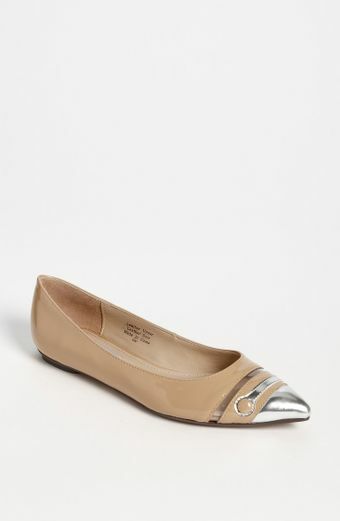 These are my perfect understated but, holy cow these are perfect, flats. A pointy toe, bow, in a perfect black. So there you have it. Flats don't always have to be sweet and dainty, and pumps don't always have to be the power shoe. Swap out heels for some strong flats. Your feet will thank you.